If you're looking for a truck that works as hard as you do, search no further than the 2019 Ram 1500 Tradesman. This pickup is equipped with the right features and systems to get the job done and transport you in style. Discover how the 2019 Ram 1500 Tradesman for sale in Glen Carbon, IL fits your needs when you visit Cassens and Sons Chrysler Dodge Jeep Ram. Come in and check out the 2019 Ram 1500 Tradesman inventory near Belleville, IL and pick out your pickup. If you live near Florissant, MO or near Edwardsville, IL, you're sure to find a great deal here. Stop in today and test drive a 2019 Ram 1500 Tradesman near Belleville, IL. With a choice of eight body colors, you can customize the 2019 Ram 1500 Tradesman to fit your style. Shades like Blue Streak Pearl add a little excitement to your vehicle while multiple wheel designs enhance the image you want to have. Select either a 5'7" or 6'4" box for your equipment and other cargo. Have plenty of room for the crew during the day and your family at night with either a Crew Cab or Quad Cab. Black accents contrast the bold colors of this truck while the black mesh grille stands out in a crowd. Enjoy premium comfort and convenience with Uconnect® 3 with a 5-inch touchscreen and voice command. Bluetooth® streaming audio expands your entertainment options. Go to the most remote jobsite and know you can handle the terrain in the 2019 Ram 1500 Tradesman with the available 4x4 system. Thanks to the 3.6-liter V6 engine, you have plenty of power for the task at hand. This engine is paired with an eight-speed automatic transmission for precise control. With a maximum towing capacity of 11,470 pounds, you can tow a trailer with ease. Upgrade to a 5.7-liter HEMI® V8 engine if you need more power. Modern safety features keep you on the road. 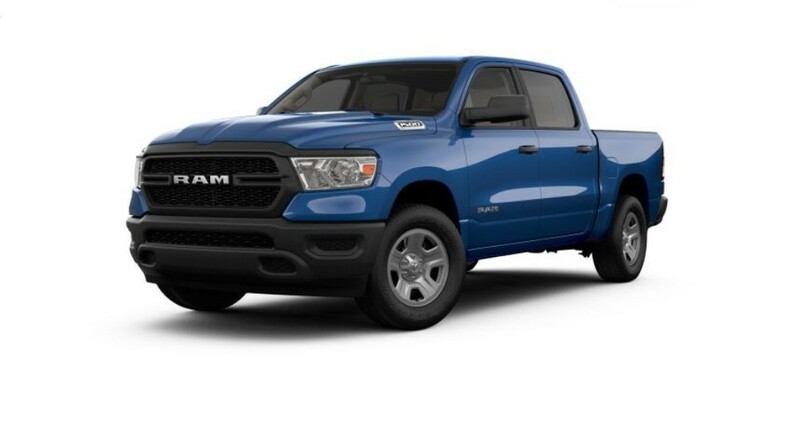 Learn more about the 2019 Ram 1500 Tradesman in Glen Carbon, IL today here at Cassens and Sons Chrysler Dodge Jeep Ram.